After launching Dropbox and providing my account credentials, I am then presented with the following screen. Where am I supposed to get the latest version of Dropbox from if not on their official website? Dropbox was previously installed on your system and in order to get the latest version you have to open your home folder with a file manager of your choice, make it show hidden files, stop the running instance of Dropbox and delete the contents of the folder .dropbox-dist. 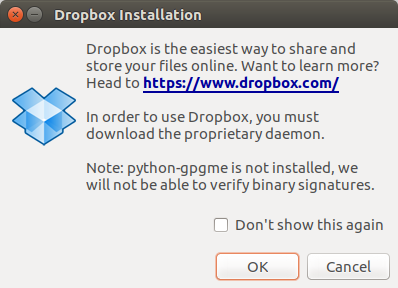 The next time you run Dropbox you'll be asked to download the proprietary daemon and will receive the latest version of the program. From then on Dropbox should keep updating on its own. First remove everything related to Dropbox from an earlier installation. Choose another installation method - just perform it the following way. Right-click the downloaded file and select to open the file with gdebi. Once the installation is finished open Dropbox from the dash. Click on OK to start the download of the proprietary daemon. 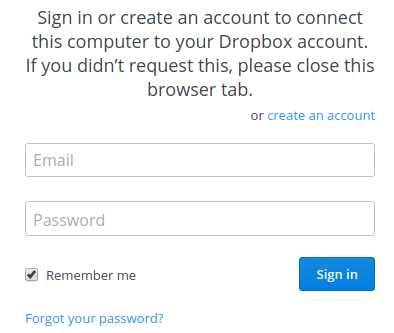 Sign in to connect the computer to your Dropbox account. Where can I get experimental versions of dropbox? Missing Dropbox indicator-applet icon, how do I get it back? Why do I still get an older version of Dropbox when downloading the latest one? How can I control Dropbox sync programmatically?